This explosion of criminal tyranny is positively frightening. This robbery and theft of Palestine must end. The FBI is assembling a massive database on thousands of Americans, many of whom have not been accused of any crime, the Washington Post's Dana Priest and William Arkin report. The reporters' latest look at the country's ballooning national security system focuses on the role that local agencies -- often staffed by people with little to no counter-terrorism training -- have played in combating terrorism since 2001. 1. The FBI's Nationwide Suspicious Activity Reporting Initiative, or SAR, currently contains 161,948 suspicious activity files, into which authorities can put information they've gathered about the people at the center of the files: employment history, financial documents, phone numbers, photos. In many cases, the people in the files have not been accused of any crime but have attracted the suspicions of a local cop, FBI agent or even fellow citizen. The files have led to five arrests but no convictions, the FBI says. Some of the files are unclassified so that local police agencies and even businesses can submit reports on anyone they deem suspicious. The government is creating a vast domestic spying network to collect information about Americans in the wake of the September 11, 2001 attacks and subsequent terror plots, The Washington Post reported Monday. The government is using for this purpose the FBI, local police, state homeland security offices and military criminal investigators, the daily added. The system collects, stores and analyzes information about thousands of US citizens and residents, many of whom have not been accused of any wrongdoing, the report noted. Artwork: Copyright Rosin Fairfield. Reproduced with the artistâ€™s permission. The Washington Post today reports on the vast growing domestic spying apparatus that the federal government is using, in conjunction with the Pentagon, to target millions of law-abiding American citizens who have not been accused of any wrongdoing. In a lengthy report entitled â€œMonitoring Americaâ€�, the Post details how a vast centralized snooping machine is being constructed and employed by local, state and federal agencies as well as military investigators, to collect, store and analyze swathes of personal information. Everything contained within the Postâ€™s article has already been reported and covered in depth by this website and others in the alternative media that have consistently warned of the threat of the exponential rise of the big brother spy system over the past decade. The report details Homeland Security head Janet Napolitanoâ€™s recent â€œSee something, say somethingâ€� campaign, which encompasses the federal government hooking up with Wal-Mart, Amtrak, major sports leagues, hotel chains and metro riders to encourage citizens to file â€œsuspicious activity reportsâ€� if they see any activity they think could be criminal or terroristic. The government defines a suspicious activity as â€œobserved behavior reasonably indicative of pre-operational planning related to terrorism or other criminal activityâ€� related to terrorism. As we reported recently, critics of the program have been literally dubbed insane by itâ€™s coordinators, despite legitimate concerns over asking citizens to effectively spy on each other for the government. The Washington Post report notes that such suspicious activity reports are just one piece of information being collected at the local and state levels and fed into a vast â€œGuardianâ€� database via fusion centers, which ultimately connect to the FBI, the DHS and even the Department of Defense. 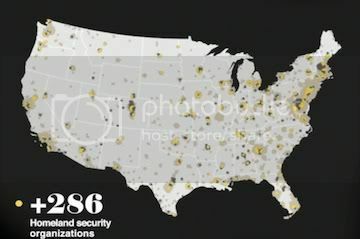 According to the report, the spook network includes 4,058 federal, state and local organizations. Intelligence centers run by states across the country have access to personal information about millions of Americans, including unlisted cell phone numbers, insurance claims, driverâ€™s license photographs and credit reports. Dozens of the fusion centers were created after 9/11 to identify potential threats and â€œimprove the way information is sharedâ€�. The centers use law enforcement analysts and sophisticated computer systems to compile, or fuse, disparate tips and clues and pass along the refined information to other agencies. The centers have received billions in funding from the Department of Homeland Security and also work in conjunction with the military arm of the DHS, NORTHCOM. They also have subscriptions to private information-broker services that keep records about Americansâ€™ locations, employment history, financial holdings, associates, relatives, firearms licenses and the like. The Washington Post report also details how equipment developed for use against insurgents and fighters in combat situations such as Afghanistan is now being employed by police and law enforcement agencies to collect information on the American people. From military-grade infrared cameras, to hand-held, wireless fingerprint scanners, to facial recognition surveillance cameras, to license plate readers, to Predator drones along the borders â€“ all are being used to snap pictures and video and record swathes of information. This will all then be fed into a giant database, cross referenced with every other piece of information collected, analyzed and stored. As the Washington Post report also notes, Homeland Security and its state and local partners have routinely targeted peaceful and lawful groups and individuals as part of its surveillance reporting. As we have seen from the MIAC report, DHS spying on tea Party and second amendment activists in Pennsylvania and a host of other examples in recent years, the federal government has little interest in Muslim extremists and has instead targeted Americans knowledgeable of their rights and critical of big government as the primary domestic terror threat. The feds have defined â€œterrorist propagandaâ€� as any material critical of the state. The Department of Defense characterizes peaceful protest as â€œlow level terrorismâ€� in its own report. Over the years we have seen countless instances of unaccountable government and military programs that have been in operation for decades, all centered around covertly spying and gathering information on American citizens. We have extensively documented such programs from COINTELPRO through to Operation CHAOS, the Defense Departmentâ€™s Counterintelligence Field Activity and the recent NSA warrantless wiretapping. Large corporations such as Google, AT&T, Facebook and Yahoo to name but a few are also intimately involved in the overarching program. Those corporations have specific government arms that are supplying the software, hardware and tech support to US intelligence agencies in the process of creating a vast closed source database for global spy networks to share information. We are constantly bombarded with the notion that the biggest threat we face is from those who reject and abhor western values, yet the government and military continue to relentlessly focus their anti-terror activity directly upon freedom loving American people, while telling them they would be completely insane to voice any concern. Steve Watson is the London based writer and editor at Alex Jonesâ€™ Infowars.net, and regular contributor to Prisonplanet.com. He has a Masters Degree in International Relations from the School of Politics at The University of Nottingham in England. Nice job,, good info. I agree wholeheartedly, in fact years past they had a system called flaged and tagged before the net. They've been busy 24 hours a day categorizing the citizenship. It would be a safe bet to assume we have been summarized. I'd be ashamed not to be on their list at this point. A vast domestic intelligence apparatus to collect information about You. "Nine years after the terrorist attacks of 2001, the United States is assembling a vast domestic intelligence apparatus to collect information about Americans, using the FBI, local police, state homeland security offices and military criminal investigators." Land of the free. â€¢ Technologies and techniques honed for use on the battlefields of Iraq and Afghanistan have migrated into the hands of law enforcement agencies in America. â€¢ The FBI is building a database with the names and certain personal information, such as employment history, of thousands of U.S. citizens and residents whom a local police officer or a fellow citizen believed to be acting suspiciously. It is accessible to an increasing number of local law enforcement and military criminal investigators, increasing concerns that it could somehow end up in the public domain. â€¢ Seeking to learn more about Islam and terrorism, some law enforcement agencies have hired as trainers self-described experts whose extremist views on Islam and terrorism are considered inaccurate and counterproductive by the FBI and U.S. intelligence agencies. â€¢ The Department of Homeland Security sends its state and local partners intelligence reports with little meaningful guidance, and state reports have sometimes inappropriately reported on lawful meetings. â€œWhat are you doing here?â€� Paul asked the armed stranger who had materialized outside his workplace. â€œJust keeping you safe,â€� replied the interloper, who had invaded the property without invitation or explanation. The visitor was clad in what Paul described as a SWAT-style dark blue jumpsuit, mirrored sunglasses, and a baseball cap. He had arrived in a white SUV equipped with running lights and displaying police markings advertising that it belonged to the Department of Homeland Security. Paul (who asked that his last name not be used) was the only employee who saw something amiss as the Homeland Security officer busied himself peering into windows and doorways and making notes on a clipboard. Understandably annoyed by the functionaryâ€™s unwarranted intrusion and patronizing reply to his question, Paul continued to demand an explanation. The visitor persisted in his Oracle at Delphi routine, offering cryptic, dismissive responses to Paulâ€™s questions. This tyranny is really getting out of control, I hope this wakes up the masses before it's too late. Re: A vast domestic intelligence apparatus to collect information about You. WaPo: FBI assembling a Stasi-style database on Americans, according to report. There are like three threads now. Mods should merge threads: mine, James Madison's and Charrington's. There's strength in numbers! In 1953, Joseph Alsop, then one of Americaâ€™s leading syndicated columnists, went to the Philippines to cover an election. He did not go because he was asked to do so by his syndicate. He did not go because he was asked to do so by the newspapers that printed his column. He went at the request of the CIA. Some of these journalistsâ€™ relationships with the Agency were tacit; some were explicit. There was cooperation, accommodation and overlap. Journalists provided a full range of clandestine services â€” from simple intelligence gathering to serving as go-betweens with spies in Communist countries. Reporters shared their notebooks with the CIA. Editors shared their staffs. Some of the journalists were Pulitzer Prize winners, distinguished reporters who considered themselves ambassadors-without-portfolio for their country. Most were less exalted: foreign correspondents who found that their association with the Agency helped their work; stringers and freelancers who were as interested it the derring-do of the spy business as in filing articles, and, the smallest category, full-time CIA employees masquerading as journalists abroad. In many instances, CIA documents show, journalists were engaged to perform tasks for the CIA with the consent of the managements America�s leading news organizations. The history of the CIAâ€™s involvement with the American press continues to be shrouded by an official policy of obfuscation and deception . . . .
â€¦ From the Agencyâ€™s perspective, there is nothing untoward in such relationships, and any ethical questions are a matter for the journalistic profession to resolve, not the intelligence community â€¦ . Many journalists were used by the CIA to assist in this process and they had the reputation of being among the best in the business. The peculiar nature of the job of the foreign correspondent is ideal for such work; he is accorded unusual access, by his host country, permitted to travel in areas often off-limits to other Americans, spends much of his time cultivating sources in governments, academic institutions, the military establishment and the scientific communities. He has the opportunity to form long-term personal relationships with sources and â€” perhaps more than any other category of American operative â€” is in a position to make correct judgments about the susceptibility and availability of foreign nationals for recruitment as spies. The Agencyâ€™s dealings with the press began during the earliest stages of the Cold War. Allen Dulles, who became director of the CIA in 1953, sought to establish a recruiting-and-cover capability within Americaâ€™s most prestigious journalistic institutions. By operating under the guise of accredited news correspondents, Dulles believed, CIA operatives abroad would be accorded a degree of access and freedom of movement unobtainable under almost any other type of cover. American publishers, like so many other corporate and institutional leaders at the time, were willing us commit the resources of their companies to the struggle against â€œglobal Communism.â€� Accordingly, the traditional line separating the American press corps and government was often indistinguishable: rarely was a news agency used to provide cover for CIA operatives abroad without the knowledge and consent of either its principal owner; publisher or senior editor. Thus, contrary to the notion that the CIA era and news executives allowed themselves and their organizations to become handmaidens to the intelligence services. â€œLetâ€™s not pick on some poor reporters, for Godâ€™s sake,â€� William Colby exclaimed at one point to the Church committeeâ€™s investigators. â€œLetâ€™s go to the managements. They were wittingâ€� In all, about twenty-five news organizations (including those listed at the beginning of this article) provided cover for the Agency. â€¦ Many journalists who covered World War II were close to people in the Office of Strategic Services, the wartime predecessor of the CIA; more important, they were all on the same side. When the war ended and many OSS officials went into the CIA, it was only natural that these relationships would continue. - Legitimate, accredited staff members of news organizations â€“ usually reporters. Some were paid; some worked for the Agency on a purely voluntary basis. - Employees of so-called CIA â€œproprietaries.â€� During the past twenty-five years, the Agency has secretly bankrolled numerous foreign press services, periodicals and newspapers â€” both English and foreign language â€” which provided excellent cover for CIA operatives. - Columnists and commentators. There are perhaps a dozen well-known columnists and broadcast commentators whose relationships with the CIA go far beyond those normally maintained between reporters and their sources. They are referred to at the Agency as â€œknown assetsâ€� and can be counted on to perform a variety of undercover tasks; they are considered receptive to the Agencyâ€�s point of view on various subjects. Murky details of CIA relationships with individuals and news organizations began trickling out in 1973 when it was first disclosed that the CIA had, on occasion, employed journalists. Those reports, combined with new information, serve as casebook studies of the Agencyâ€™s use of journalists for intelligence purposes. The New York Times â€” The Agencyâ€™s relationship with the Times was by far its most valuable among newspapers, according to CIA officials. [It was] general Times policy â€¦ to provide assistance to the CIA whenever possible. â€¦ CIA officials cite two reasons why the Agencyâ€™s working relationship with the Times was closer and more extensive than with any other paper: the fact that the Times maintained the largest foreign news operation in American daily journalism; and the close personal ties between the men who ran both institutions â€¦ . The Columbia Broadcasting System â€” CBS was unquestionably the CIAâ€™s most valuable broadcasting asset. CBS president William Paley and Allen Dulles enjoyed an easy working and social relationship. Over the years, the network provided cover for CIA employees, including at least one well-known foreign correspondent and several stringers; it supplied outtakes of newsfilm to the CIA; established a formal channel of communication between the Washington bureau chief and the Agency; gave the Agency access to the CBS newsfilm library; and allowed reports by CBS correspondents to the Washington and New York newsrooms to be routinely monitored by the CIA. Once a year during the 1950s and early 1960s, CBS correspondents joined the CIA hierarchy for private dinners and briefings. Time and Newsweek magazines â€” According to CIA and Senate sources, Agency files contain written agreements with former foreign correspondents and stringers for both the weekly news magazines. The same sources refused to say whether the CIA has ended all its associations with individuals who work for the two publications. Allen Dulles often interceded with his good friend, the late Henry Luce, founder of Time and Life magazines, who readily allowed certain members of his staff to work for the Agency and agreed to provide jobs and credentials for other CIA operatives who lacked journalistic experience. â€¦ At Newsweek, Agency sources reported, the CIA engaged the services of several foreign correspondents and stringers under arrangements approved by senior editors at the magazine. â€¦ â€œTo the best of my knowledge:â€� said [Harry] Kern, [Newsweek's foreign editor from 1945 to 1956] â€œnobody at Newsweek worked for the CIAâ€¦. The informal relationship was there. Why have anybody sign anything? What we knew we told them [the CIA] and the State Departmentâ€¦. When I went to Washington, I would talk to Foster or Allen Dulles about what was going on â€¦. We thought it was admirable at the time. We were all on the same side.â€� CIA officials say that Kernâ€™s dealings with the Agency were extensive. â€¦ When Newsweek was purchased by the Washington Post Company, publisher Philip L. Graham was informed by Agency officials that the CIA occasionally used the magazine for cover purposes, according to CIA sources. â€œIt was widely known that Phil Graham was somebody you could get help from,â€� said a former deputy director of the Agency. . . . But Graham, who committed suicide in 1963, apparently knew little of the specifics of any cover arrangements with Newsweek, CIA sources said. â€œAnd thatâ€™s just a small part of the list,â€� in the words of one official who served in the CIA hierarchy. Like many sources, this official said that the only way to end the uncertainties about aid furnished the Agency by journalists is to disclose the contents of the CIA files â€” a course opposed by almost all of the thirty-five present and former CIA officials interviewed over the course of a year. The CIAâ€™s use of journalists continued virtually unabated until 1973 when, in response to public disclosure that the Agency had secretly employed American reporters, William Colby began scaling down the program. In his public statements, Colby conveyed the impression that the use of journalists had been minimal and of limited importance to the Agency. â€¦ After Colby left the Agency on January 28th, 1976, and was succeeded by George Bush, the CIA announced a new policy: â€œEffective immediately, the CIA will not enter into any paid or contract relationship with any full-time or part-time news correspondent accredited by any U.S. news service, newspaper, periodical, radio or television network or station.â€� . . . The text of the announcement noted that the CIA would continue to â€œwelcomeâ€� the voluntary, unpaid cooperation of journalists. Thus, many relationships were permitted to remain intact. The Agencyâ€™s unwillingness to end its use of journalists and its continued relationships with some news executives is largely the product of two basic facts of the intelligence game: journalistic cover is ideal because of the inquisitive nature of a reporterâ€™s job; and many other sources of institutional cover have been denied the CIA in recent years by businesses, foundations and educational institutions that once cooperated with the Agency. Glad to see the Washington Post (official CIA psyops journal) is finally writing articles exposing the truth of the panopticon built around us. Too bad they're a little fu*king late to the party. What do you suppose this article is for? Are they trying to 'normalize' the prison/surveillance system society we're living in? If it appears in the Washington Post, does that make it ok? As Steve Watson points out in his Inforwars article, this is not 'news'. Why is the Washington Post now printing information that they've been sitting on for at LEAST 10 years? Because it's 'normal'... or to make it normal? of the threat of the exponential rise of the big brother spy system over the past decade. Good question: Why is the Bilderberg controlled MSM source, WaPo, bringing this to Mr. And Mrs. America's attention, right now? Wikileaks is getting ready to publish 'leaks' (e.g., CIA controlled 'leaks') exposing the banksters (or selected banksters). This may be an announcement, "Don't Try Anything: You are In a Panopticon"... something to intimidate. Not hard to connect these dots. And it grows: $725 BILLION DOLLARS for 2011 military budget. It's expensive to maintain and expand a panopticon. I often talk to friends and family of this very subject and usually receive similar responses. The "I know but am afraid of being targeted" and "you had better be careful or you'll end up on a list" or "If I don't get involved it will never effect me." Everyone is being watched and databased, so you either stand and be counted among those willing to fight tyranny or be counted among the silent waiting in fear in hopes those fighting are victorious, or absent that outcome, to never be noticed or considered to be a threat. How sad is ones life if fear is the predominate controlling aspect. This is most likely intended to induce and foment anger among the true patriots leading to physical violence which is what the NWO needs to declare martial law here in the U.S.
We must guard against emotional overload and physical retaliation if our messages to the masses are to have a positive lasting effect. Conditioning. Slowly easing you into the NWO so you are not aware of it. Horrible.